I have a hard time working in silence. I always have a podcast or television on. I like it to be talking noise not music. At some point music gets repetitive. I know I’m weird. Sometimes I have a documentary or a movie playing in the background. I’m never really paying attention I just like to have it playing in the background. Recently I had on a movie that was about a mob family that was in witness protection. In the movie, the mother takes a big plate of roasted peppers in olive oil over to the Feds surveilling them from across the street. They rip into a big crusty loaf of bread and dive into the peppers. I immediately I thought I needed to make roasted peppers in olive oil! Something amazing that happens when roasting peppers over a fire until their skin blackens and blisters. The peppers become extra sweet with a hint of smoky char. It’s truly an amazing thing. Oh! And, please, please do not rise off. It washes away the delicious smokey flavor. Roasted peppers marinating in olive oil and garlic is magical. They become sweet, savory and smoky. It’s a beautiful thing! I like to think of this like bruschetta’s hotter older sister. 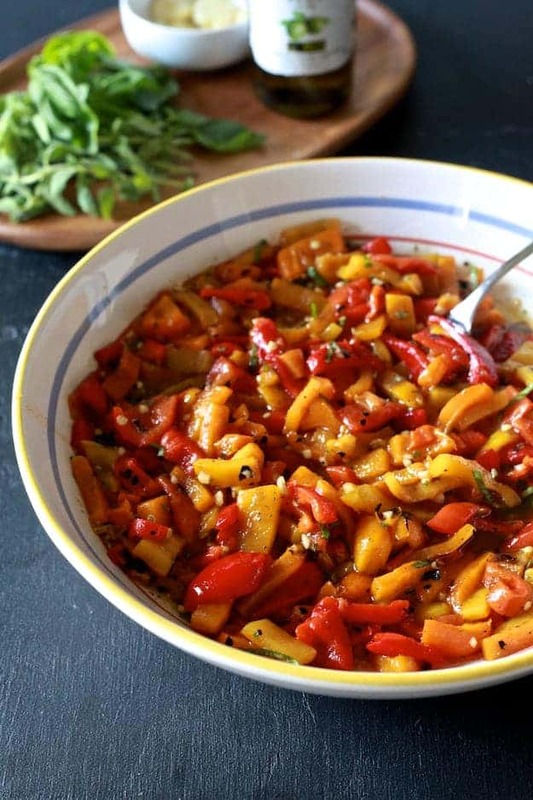 The possibilities are endless when it comes to roasted peppers in olive oil. Make a double or triple batch and they are perfect for canning. Serve them toss in with your favorite salad, over grilled chicken or in a pasta. But my favorite way to enjoy them is with toasted warm bread and prosciutto. The crunch of the bread, saltiness of the prosciutto and sweetness of the peppers literally made my eyes roll into the back of my head. It truly an amazing thing that happens. Gas Stove: Place peppers directly on stove top burners with flames on high. Leave over flame until skin begins to blacken and blister. Turn peppers until blacken and blistered on all sides. Oven Broiler: Place peppers on a sheet pan. Place under HI broiler until the skin begins to blacken and blister. 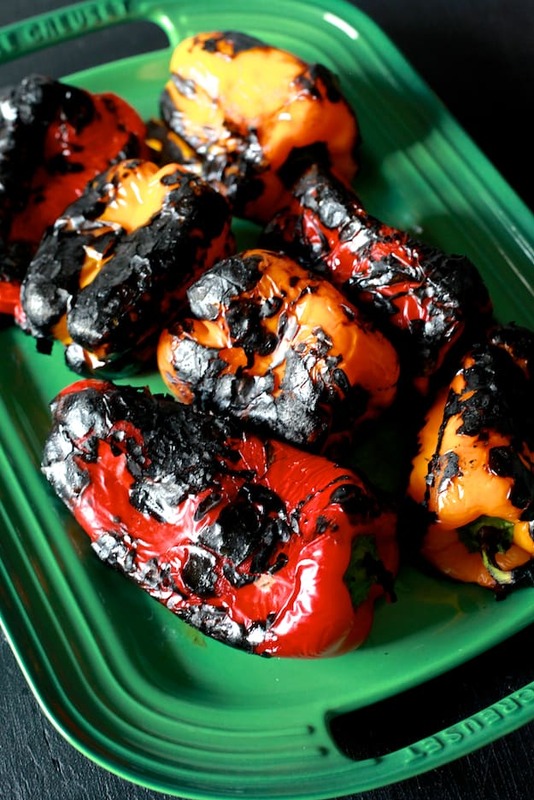 Turn peppers until blackened and blistered on all sides. 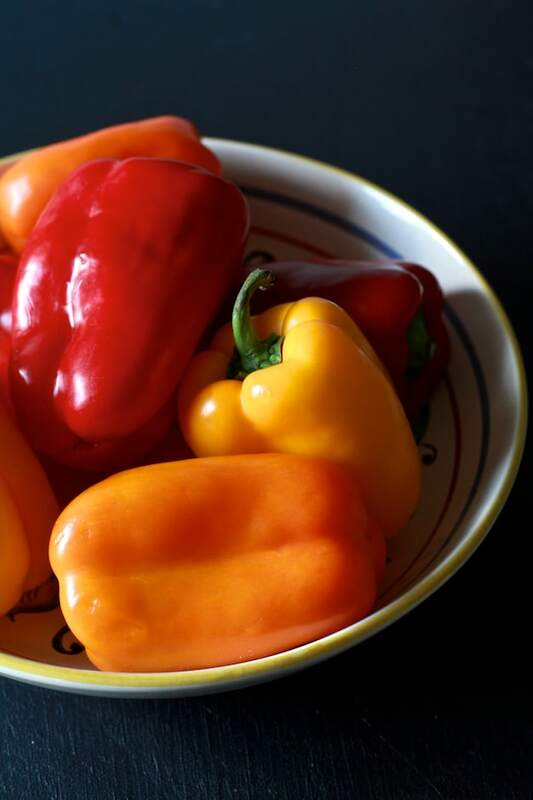 Transfer peppers to a paper bag or a large container with a lid. Leave the peppers to steam for 10 minutes. Once the peppers are cool enough to handle removed the skin. Do not rinse the peppers. Remove the stem and seeds. Quarter the peppers and thinly slice. 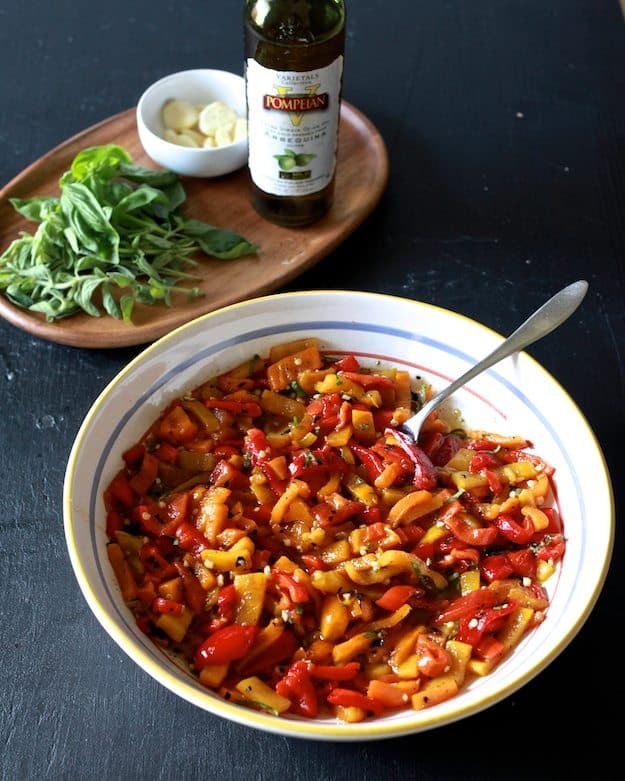 In a large bowl combine roasted peppers, olive oil, garlic, and herbs. Mix until well combined, season with salt to taste. Cover and let marinade for 30 minutes. Serve room temperature with crusty bread. So I’m watching this movie where the mob boss takes roasted peppers to the Feds and I think “let me look up how to make roasted red peppers” !!!!! Hahahaha and here I am! Bravissima, Meseidy! I grew up eating this recipe often in my Italian family and now I make them in my own household. 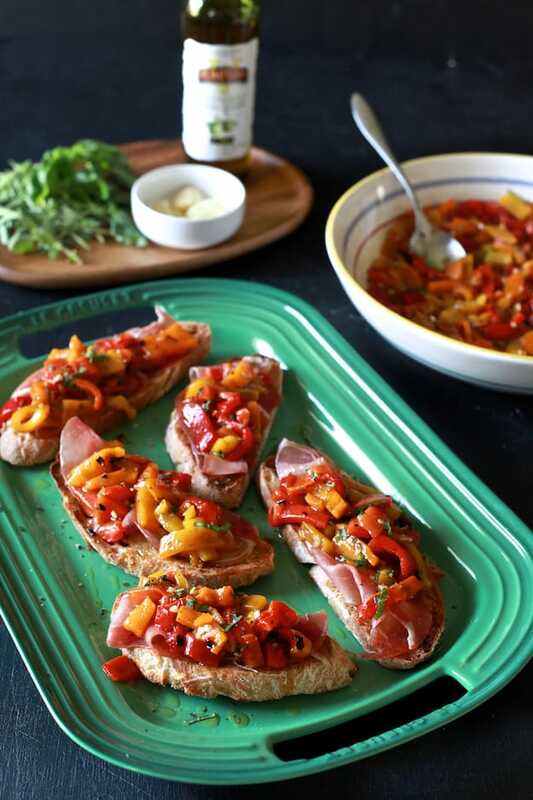 I love to serve these as an appetizer exactly the same way as you do–on crostini with prosciutto. I have also put them on crostini without prosciutto and added a small piece of fresh mozzarella and popped the baking tray under the broiler for a few seconds to melt the cheese–divine! Lovely pictures! So, is there an easy way to can these in little jars so that we can save them? We always have jars go bad as we don’t use them fast enough. I absolutely love this recipe. Can’t wait to try out the new oils.